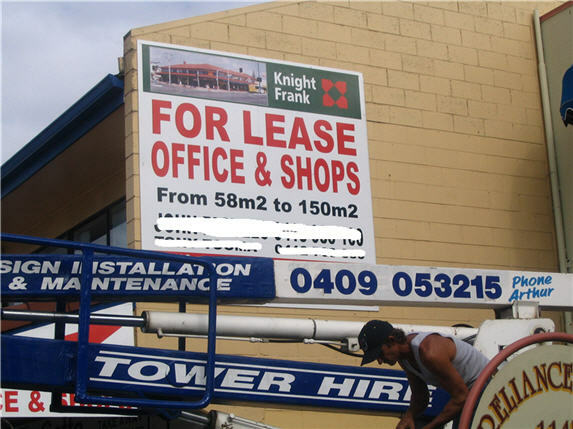 Here in our office block there are 2 offices and a retail shop currently vacant. They’ve been vacant for about 3 months. And the owner is getting worried. I know that because there is presently a small crane outside my window putting up a large sign advertising the offices and shop. It’s been at the building all morning afixing 2 other large signs. In the 4 years I’ve been here the owner has always had vacant offices. But this is the first times he’s put big signs up advertising the fact. Wouldn’t it be better to have the signs up all the time so you can always have leads coming in, rather than wait for a vacancy and then put a sign up? Wouldn’t it be better to advertise all the time, not just when you haven’t got much work on? That way you’ll never be struggling for work, or a tenant. Not knowing what the neighborhood is like or the reputation of the building, if I saw a sign up all the time, I’d think it was a bad neighborhood, or unsafe building (mad tenents), or a high-rent area.